There are 300 cruises from California to Mexico each year. 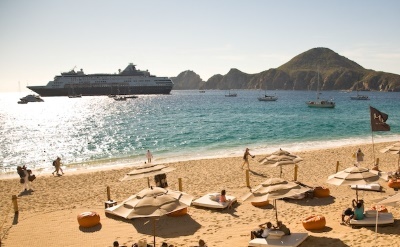 Depart from San Diego, Los Angeles or San Francisco for the sunny beaches of Baja or the Mexican Riviera. Trips range from 2 days to 10 days in duration. The complete schedule of cruises is below. Ensenada is at the northern end of the Mexican Baja peninsula. Go kayaking, scuba diving, or whale watching. The food is a big attraction, with its own regional "Baja Med" cuisine. 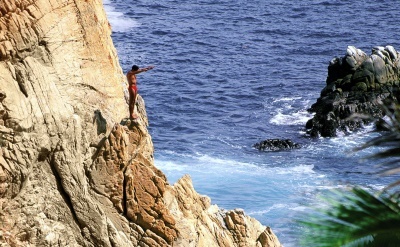 Cabo San Lucas is at the southern end of the Baja peninsula. A tropical desert climate offers warm temperatures throughout the year. Kayak to El Arco rock, take the challenge of sportfishing, or snorkel with the marine life. Or simply relax with a margarita in a cantina. 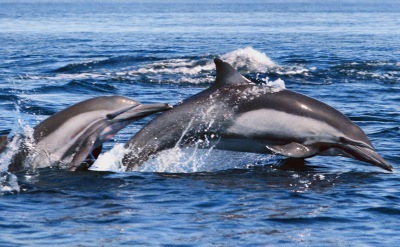 Puerto Vallarta attractions include Banderas Bay and the Sierra Madre. Explore the streets, shops and markets of the old town. Lay on the beach or join an excursion to mountain jungles. 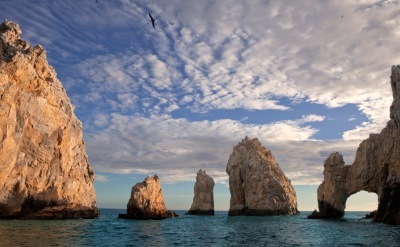 3-day cruises to Baja Mexico on Carnival Cruise Line. Round-trip from Long Beach to Ensenada (Mexico). • 2019 departures: April 4, 5, 11, 12, 18, 19, 25, 26; May 2, 3, 9, 10, 16, 17, 23, 24, 30, 31; June 6, 7, 13, 14, 20, 21, 27, 28; July 4, 5, 11, 12, 18, 19, 25, 26; August 1, 2, 8, 9, 15, 16, 22, 23, 29, 30; September 5, 6, 12, 13, 19, 20, 26, 27; October 3, 4, 10, 11, 17, 18, 25; November 1, 7, 8, 14, 15, 21, 22, 28, 29; December 5, 6, 12, 13, 19, 20, 26, 27. 4-day cruises to Baja Mexico on Carnival Cruise Line. Round-trip from Long Beach to Catalina Island (California) and Ensenada (Mexico). • 2019 departures: April 1, 7, 8, 14, 15, 21, 22, 28, 29; May 5, 6, 12, 13, 19, 20, 26, 27; June 2, 3, 9, 10, 16, 17, 23, 24, 30; July 1, 7, 8, 14, 15, 21, 22, 28, 29; August 4, 5, 11, 12, 18, 19, 25, 26; September 1, 2, 8, 9, 15, 16, 22, 23, 29, 30; October 6, 7, 13, 14, 21, 28; November 3, 4, 10, 11, 17, 18, 24, 25; December 1, 2, 8, 9, 15, 16, 22, 23, 29, 30. 7-day cruises to the Mexican Riviera on Carnival Cruise Line. Round-trip from Long Beach to Cabo San Lucas (Mexico), Mazatlan (Mexico) and Puerto Vallarta (Mexico). • 2019 departures: April 6, 13, 20; May 11, 18, 25; June 1, 8, 15, 22, 29; July 6, 13, 20, 27; August 3, 10, 17, 24, 31; October 12; November 2, 9, 16, 23; December 14, 21, 28. 2-night cruise to Mexico on Disney Cruise Line. Round-trip from San Diego to Ensenada (Mexico). • 2019 departures: April 12, April 19, October 18. 3-night cruise to Mexico on Disney Cruise Line. Round-trip from San Diego to Ensenada (Mexico). 4-night cruises to Mexico on Disney Cruise Line. Round-trip from San Diego to Cabo San Lucas (Mexico). • 2019 departure: April 3, October 14. 5-night cruises to Mexico on Disney Cruise Line. Round-trip from San Diego to Cabo San Lucas (Mexico) and Ensenada (Mexico). • 2019 departures: April 7, April 14, October 4, October 9, November 3. 7-night cruises to Mexico on Disney Cruise Line. Round-trip from San Diego to Cabo San Lucas (Mexico), Mazatlan (Mexico) and Puerto Vallarta (Mexico). • 2019 departures: April 21, April 28, May 5, October 20, October 27. 7-day cruises to Mexico on Holland America Line. Round-trip from San Diego to Cabo San Lucas (Mexico), Mazatlan (Mexico) and Puerto Vallarta (Mexico). • 2019 departures: April 7, April 14, April 21. 7-day cruises to Mexico on Norwegian Cruise Line. Round-trip from Los Angeles to Puerto Vallarta (Mexico), Mazatlan (Mexico) and Cabo San Lucas (Mexico). 5-day cruise to Mexico on Princess Cruises. Round-trip from Los Angeles to Cabo San Lucas (Mexico). 7-day cruises to Mexico on Princess Cruises. Round-trip from Los Angeles to Puerto Vallarta (Mexico), Mazatlan (Mexico) and Cabo San Lucas (Mexico). • 2019 departures: April 6, April 13, April 20, April 27. 10-day cruises to Mexico on Princess Cruises. Round-trip from San Francisco to Puerto Vallarta (Mexico), Manzanillo (Mexico), Mazatlan (Mexico) and Cabo San Lucas (Mexico). • 2019 departures: September 23, October 3, December 18.